Best Language Resources: Just about every speech-language pathologist I know has their own favourite therapy materials that they use every day, or every other day. My favourite resources are piled into two battered suitcases with carry handle and wheels. The contraptions weigh a bit but can be wheeled around. Over the years I've gotten picky about what gets loaded in there. Have A Great Therapy Resource or Idea to Share? Do you have a great idea for language therapy, or a favourite resource? Share it with the world! The object of the game is to construct a castle before your opponent. The game features dozens of cardboard tiles of castles wall, towers and castle keeps. 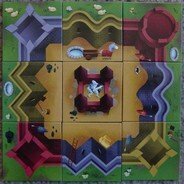 The first to complete their castle wins the game. Kids of all ages love playing it! An advantage of the game is it's size - compact, light and contained in a small box. The game also works as a visual matching, scanning, and motor planning activity. Many of the themes in the Arrival are complex. 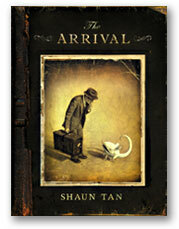 For this reason I use the Arrival as a language text for older children, between the ages of 10 - 14. The Arrival has no text but its visual language is sophisticated and a rich source of information. I can often spend a 30 minute session on just one panel. A great resource. The Help series of books (a five book set) feature hundreds of pages of language activities. The activities cover the full spectrum of language learning, from phonemic awareness, critical thinking, social language and grammar - to name just a few of the concepts covered. Indispensable. Some of the best language resources in print. Like the Arrival, the Frog series are wordless picture books that tell a story using clever, beautifully drawn illustrations. One of the most used and best language resources in my collection. Camelot Jr is a wooden block set that has increasingly complex puzzles to solve. As is stated on the box cover, the age range is 4 - 99 years. The goal of the game is to build a staircase so that the little knight can rescue the princess. 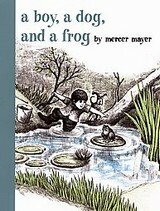 A booklet is provided that charts 48 different scenarios from Starter to Junior, and from Expert to Master. 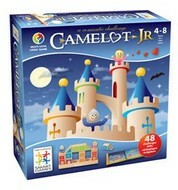 Camelot Jr is a logic game that increases spatial awareness, thinking skills and creativity, and is great for all ages. All of the Master scenarios are difficult and do require lateral thinking and a lot of trial and error, even for adults.